I found yesterday's entry about 'land rowing' by Tim Koch fascinating. It reminded me of an article and ad I had seen in the current (December 2011, Vol. 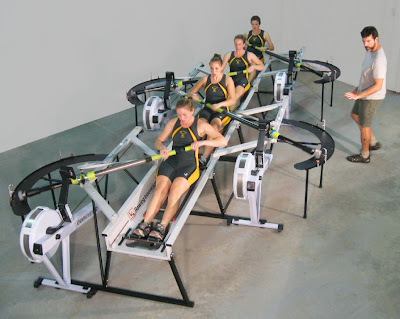 18, Issue 10) issue of Rowing News about a fairly new innovation called Swingulator Dry-Tank Rowing Simulator. This product is the brain child of Rick Kelliher, rowing coach at the University of Vermont. The idea is that for those rowing teams which can not afford to buy or have the space for a rowing tank, the Swingulator is a simpler and cheaper solution, Rowing News writes. The machine costs around $20,000 for an 'eight', but is bought by the 'pairs'. For more information, go to Rowing Innovations. Of course, anyone aware of the rich history of the sport of rowing knows that any 'new innovation' has very likely been patented many decades ago, rowing historian Bill Miller writes in an article, "Rowing Equipment Patents (U.S.)". That is a really really clever invention! I might actually be able to learn to sweep row instead of scull with that!